Harmonix has been dropping hints for weeks and finally the cat is out of the bag: HARMONIX ANNOUNCES ROCK BAND 4 COMING TO PLAYSTATION®4 AND XBOX ONE™. As you tell, I am fracking excited! Harmonix is working with Mad Catz on new controllers for the Xbox One and Playstation 4. Additionally, starting everyone can preorder the game at http://www.rockband.com/preorder. Let’s continue on to check out the press release with the full details! 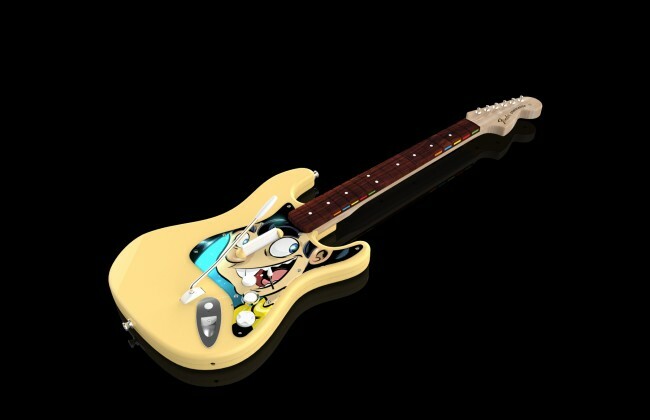 Lucky fans that are attending PAX East will be able to pre-order and exclusive Penny Arcade themed guitar at Harmonix’s Booth. Harmonix is excited to announce that it is teaming up with Mad Catz to bring Rock Band™ 4, the next generation of the award-winning social and interactive music gaming platform, to PlayStation®4 computer entertainment system and Xbox One, the all-in-one games and entertainment system from Microsoft®. Players can guarantee that they can be ready to rock with new hardware on release day by signing up to be alerted when pre-orders go live at http://www.rockband.com/preorder. Additionally, fans attending PAX East in Boston between March 6 and March 8 can pre-order an exclusive Penny Arcade-themed guitar in person at Harmonix’s booth, #4224. Rock Band 4 brings the critically-acclaimed franchise to a new generation of consoles, focusing on the features and gameplay that people love, and expanding the franchise in innovative ways that were informed by how fans play and what they want. Harmonix will reveal to its fans more details about exciting new features of Rock Band 4 this coming May. STILL THE MOST MUSIC. PERIOD. In addition to a killer on-disc soundtrack, Rock Band 4 will support over 2000 tracks released since the 2007 launch of the original Rock Band, accounting for more than 500 of rock music’s most legendary artists. Players who’ve purchased or downloaded playable tracks on last-generation consoles will be able to download and play those tracks on their new platforms at no additional charge*. Hundreds of tracks will be available at launch, with more back catalog music – and new tracks – to be added regularly after launch. Rock Band 4 will be available later this year. For more information, head over to http://www.harmonixmusic.com and follow @RockBand on Twitter for updates. For more information on Rock Band and Harmonix Music Systems please visit http://www.harmonixmusic.com. * The timing of release of “legacy” DLC on next-generation consoles is to be determined and may be subject to change. “Legacy” DLC will be downloadable and playable in Rock Band 4 only after the DLC is released on next-generation consoles. © 2015 Harmonix Music Systems, Inc. All Rights Reserved. Harmonix, Rock Band 4, Rock Band 3, Rock Band Blitz, Rock Band and all related titles and logos are trademarks of Harmonix Music Systems, Inc. Rock Band 4, Rock Band 3, Rock Band Blitz and other related products and services developed by Harmonix Music Systems, Inc. All other marks are the property of their owners. Microsoft, Xbox One, and Xbox 360 are trademarks of Microsoft Corporation in the United States and/or other countries.